The HA-DSBG may be considered our "entry" level tripod speaker stands but is one of our most popular models thanks to the rock solid design and construction. 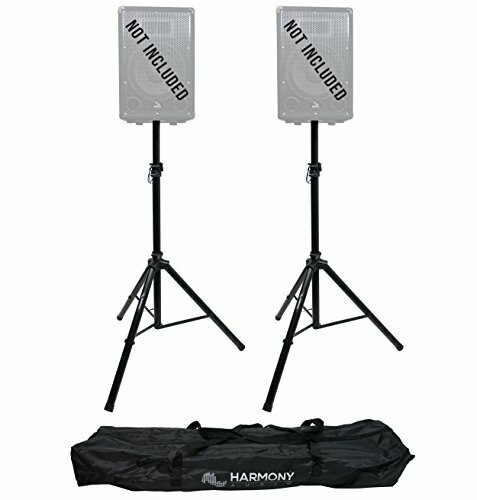 The stands features an adjustable height range from 4 to 7 feet with a 1 3/8" (35mm) pole which is the standard size for most DJ / Pro Audio speakers. The tripod legs and pole are locked into position with easy to use twist knobs and features an additional safety catch pin to avoid sudden speaker drops. The stands can be setup in a matter of second and is constructed from tubular steel so it can take the bumps of the road, a travel bag is also included to make transporting them even easier. Tripod leg length - 26"